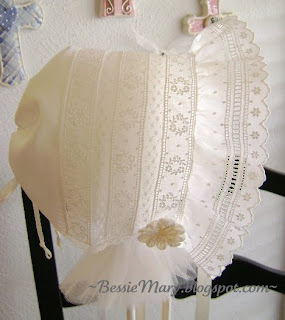 This bonnet is so simple, but so sweet! Construction incorporates the basics of heirloom sewing by machine: joining lengths of lace and Swiss entredeux insertion with a tiny zig zag stitch. A ruffle of wide Swiss edging, rolled and whipped to the fancy band, frames the baby's face. A narrow piece of Swiss Nelona is rolled and whipped to the back. It is then gathered with ribbon run through a narrow casing. This little bonnet could not be more simple to construct! It originally was a linen hand towel with a wide cutwork border. Again, a narrow casing in the back shapes the bonnet. This was the project in a class taught by Jeannie Baumeister at a past Smocking Arts Guild of America (SAGA) Convention. 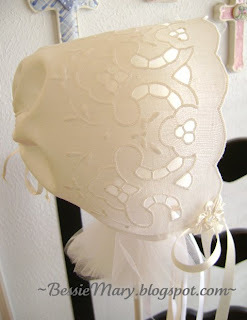 The streamers on both bonnets are embellished with silk satin ribbon rosettes -- one of my favorite embellishments! I normally use ribbon that is approximately 1/2" wide. Cut a piece of ribbon 9-1/2" long. Make a mark 1/4" from the end, at the top of the ribbon. Continue marking the length of the ribbon at 1" intervals. At the bottom of the ribbon, make another series of marks. These marks are also 1" apart; however, they are staggered halfway between each of the marks at the top. Please note that these very large markings are for photography purposes only! You have no idea how many heart palpitations I had marking this beautiful silk satin ribbon with huge blue blobs! The blobs may also cause some of the measurements above to appear a little skewed. Sorry! Your marks should be tiny -- just a speck. I often just eyeball the measurement, or finger press them into place. Next, bring the raw ends together and stitch a tiny 1/4" seam. This is why you placed that first mark at the 1/4" spot. Again, contrasting orange thread used only for photography. 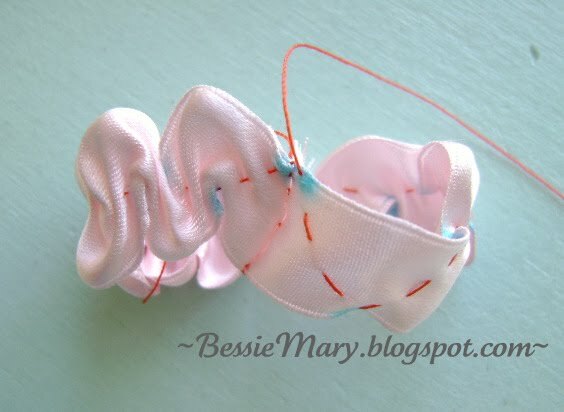 You will use sewing thread that matches your ribbon. 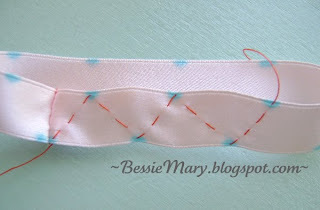 Some directions for ribbon rosettes instruct you to stitch the seam later in the process. I have found it is easier to stitch before beginning to gather the rosette. Use a single thread. 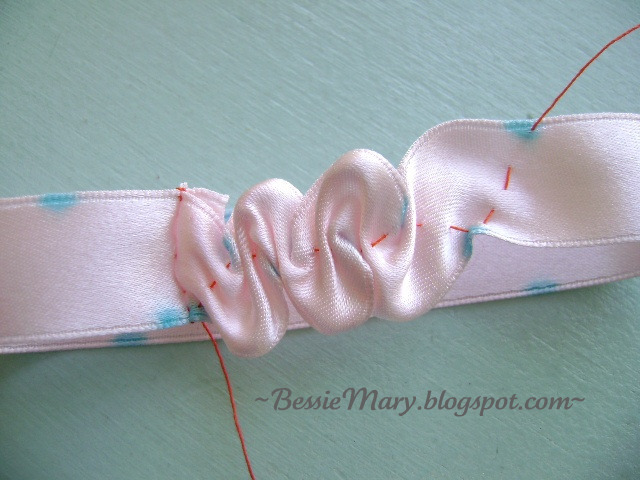 Be sure to knot at both the beginning and the end of the seam. You don't want your beautiful rosette falling apart! 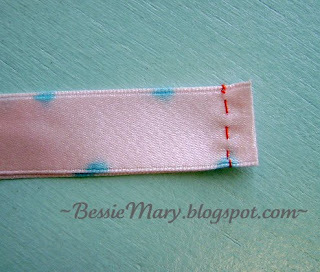 After stitching and clipping your thread, turn the ribbon circle right side out, and finger press the seam open. Now, play Dot to Dot! Again, using a knotted single thread, connect the dots with running stitches. Begin stitching at the seam you stitched in the last step. I have not found that there is any magic to the number or length of stitches. Normally, I get about 3-4 stitches on the 1/2" width ribbon. Since the seam is already stitched and finger pressed open, my needle and thread do pierce the seam allowance. I find that this helps to hold the beginning knot a little more securely. 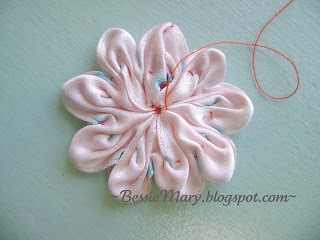 The stitches also help hold that little seam allowance in place when you begin to form the actual rosette. After connecting several of the dots, pull the thread gently to gather the ribbon. You may find the ribbon gathers more easily and smoothly, if you hold your thumb over it while pulling the thread with your other hand. Continue stitching and connecting the dots. You should finish connecting the dots at the seam where you began. Again, my needle and thread pierced the seam allowance on the back. Gently pull the thread to gather the ribbon in a circle. Next, take just a nip in the top of each petal. You will simply be taking your needle and thread through the top of each little peak. When you have gone all the way around, tug gently to pull the petals together and close the center. Your rosette will also begin to flatten. You may have to smoosh it a little and help it along! I usually take a couple of tiny stitches in the center, pulling everything together neatly. Take the needle and thread to the back and tie off. You may still need to smoosh or arrange the petals to your liking. Yes, I love the word "smoosh"! Some of the edges may cup up, and others under. You are the creator of this rosette, and may determine which way you like best! I prefer mine to cup under. Look how beautiful it can be when stitched with matching thread and no blue blobs! A tiny mother of pearl shank button in the center helps to hide any stitches. I also use the button to help attach the rosette and the streamers to the bonnet. A few extra tacking stitches will help to secure and position any stray little petals or gathers. 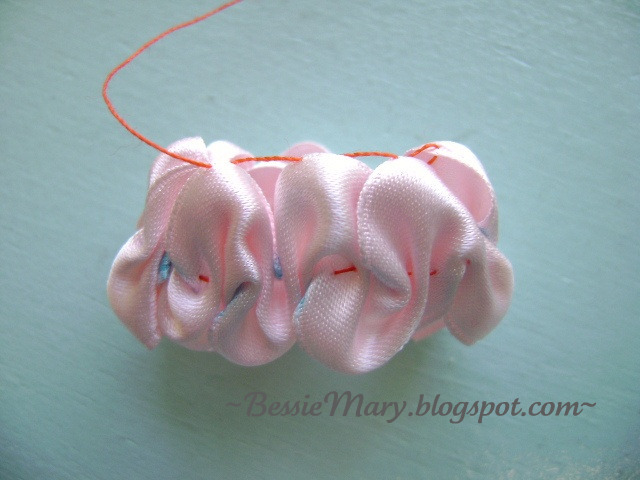 I hope you also enjoy making beautiful rosettes for sweet little bonnets! I truly love these bonnets. The rosettes are so pretty. Gorgeous! Love these and thanks for the tutorial on the rosette. I love that first bonnet from the insertions. The first bonnet is amazing! Thank you for the rosette tutorial! It looks very easy and fun! I can't wait to try it! Oh My Word!!! I love, love, love the rosette! Thanks sooo much for the tutorial and what a beautiful bonnet!!! I agree with Laurie, just love these elegant, yet simple bonnets and the rossette truly ads to them !!!!!!!!!!! Can't wait to try out the rossette, great easy tutorial steps & pics!!! Beautiful bonnet and thank you for the rosette tutorial. Love the rosette, thanks for the tutorial. Bonnets are my favorite as well. Those bonnets are amazing!!!!! It makes me wish my little girl was a baby again. I have never seen rosettes made that way before. They are so pretty!!! The little bonnets are just gorgeous! 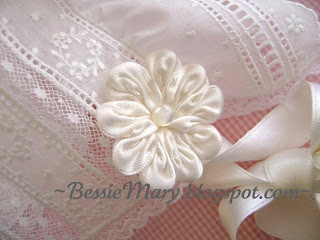 The rosette is really pretty and the tutorial makes me want to run go try one right now! Jan....the bonnets are spectacular and the rosettes are the most beautiful I have ever seen!!!! I am so in awe of your stitchery on the bonnets! They are really beautifully done. I would like to use your rosettes on the burial bonnets we stitch. May I borrow those instructions? for charity purposes only? 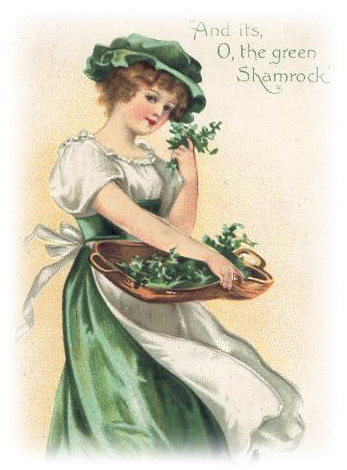 Karen, ribbon rosettes have been used on bonnets and other garments for a very long time. They are certainly not unique to me. Just something that I adore! Directions for this type of rosette is not always easy to find. I just shared my way of doing them. What a blessing your bonnets must be to grieving families. Please feel free to use the instructions, as you continue blessing the tiniest of angels and their families. Thank you, thank you, THANK YOU, Jan, for making this seem so simple. I am going to practice making some right now!!!!! I've just become your newest follower and wanted to thank you so much for your tutorials on the lovely rosettes. I came by via Pinterest and I am so pleased I did as your blog is wonderful. I love these little bonnets. Thank you for sharing your talents with us! Blessings for a wonderful Holy Week as we lead up to Easter Sunday! It's such a beautiful flower. I sure will try to make it. The bonnet is absolutely beautiful! Thank you so much for teaching me how to do the rosettes. I have tried to teach myself, but the results haven't been successful. Thank you so much. I pray your eyes are doing better. Sarah, one-half inch ribbon would probably make a rosette about 1" - 1.25" in diameter. The size can vary depending upon how tightly the ribbon is manipulated. I have never timed how long it takes to make a rosette. I sew for pleasure, and not a timed event!